One of our biggest joys at Deeper Roots Coffee is connecting farmers with the baristas who serve their coffee every day. We get to do this pretty regularly, taking small groups of coffee-pilgrims to Guatemala during harvest. But, from time to time, we also bring whole teams of coffee professionals and coffee lovers to Guatemala to get their hands dirty as well. In May, Greyhouse Coffee in West Lafayette, IN came to Santa Maria de Jesus, Guatemala with 14 people to meet the La Armonia Hermosa farmers, learn about coffee farming and help build parts of our new processing mill there. Before coming, Greyhouse ran a campaign with their customers to raise funds for a generator for the mill. Through their generosity, together they raised enough to purchase the generator and buy some additional supplies for the mill. The roof is going up on the new wet mill. 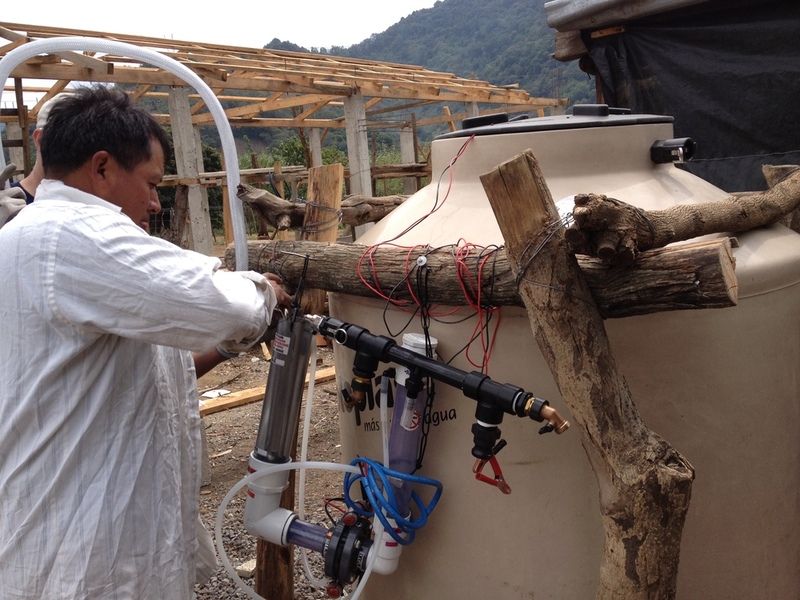 Julio running the new water filteration system. During their trip the baristas, and other students from Purdue University, had the opportunity to help construct the roof for our new wet mill, start seedlings for the new coffee nursery, and work on some small engineering projects. One of those projects was to install and train on a water filtration system so they can collect rain water for drinking from the roof of the mill. The mill has been a dream for many years now and will greatly increase the production capacity for the Santa Marian farmers which means more and even better La Armonia Hermosa coffee for us here in the States! Construction started last summer with another group from Mississippi having come down to pitch in as well. The project is the work of many hands, and though we "gringos" may not be the most skilled laborers, the relationships forged while working together with Julio Cuy and the community of Santa Maria has made a great impact on both sides of our coffee chain. You'll no doubt be seeing many more updates on the progress of the mill and its inaugural use in this coming year's harvest. In the meantime, fingers crossed, our fresh crop of La Armonia Hermosa will be here in a few weeks! !